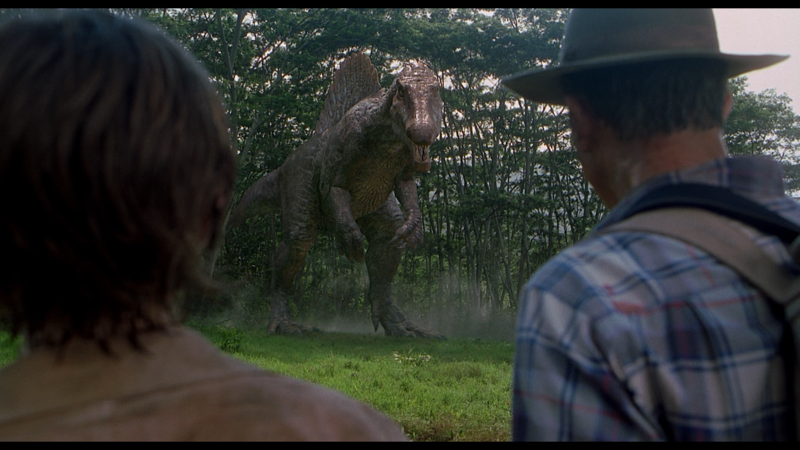 The only known Spinosaurus individual on Isla Sorna, this animal was the result of illegal cloning activities performed by InGen in 1999. The introduction of the species into the established Isla Sorna ecosystem caused considerable chaos, and threw Isla Sorna’s population into imbalance. This imbalance caused a population drop that coincided with a number of species returning to extinction. It is unknown what gender this animal was, and measured 43’9″ long, and 19’7″ at the top of the sail (16′ at the top of the cranium). This Spinosaurus is the individual encountered in 2001 by the rescue team that was stranded on Isla Sorna when in search for twelve year old Eric Kirby, who was himself stranded on the island eight weeks prior during a paragliding accident. 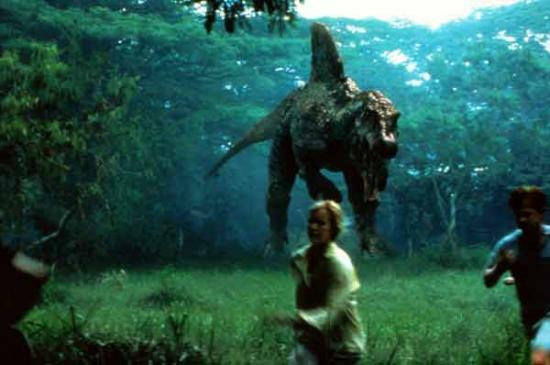 It was apparently very territorial and was attracted to the pheromones found in the urine of other carnivores, as Eric Kirby found out some time during his stay on Isla Sorna . After the plane that Paul and Amanda Kirby chartered to Isla Sorna landed on the island’s airstrip, mercenaries Cooper and Nash entered the jungle nearby to create a safe perimeter for the group while they searched for their son. 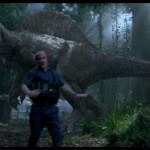 However, the pair encountered the Spinosaurus, and Cooper attacked it with his rifle, but did not harm it. Nash was able to make it back to the plane and start it up, but Cooper fell behind. As the plane made it’s way down the runway to take off, Cooper stumbled out of the jungle and stood on the runway, where he attempted to flag the plane down. While Cooper stood on the runway yelling for the plane to stop, the Spinosaurus burst out of the jungle and snapped Cooper up. 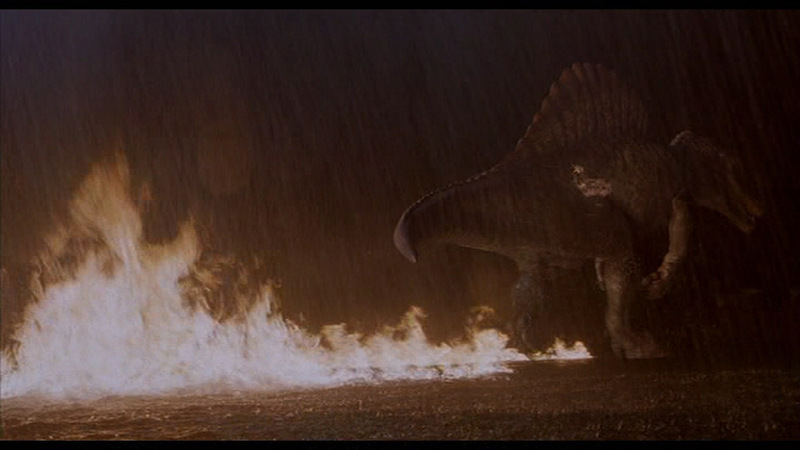 This forced Nash to make a premature take-off, which clipped the Spinosaurus‘ thigh. 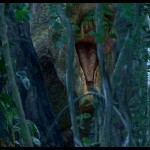 Crashing back into the jungle, the Spinosaurus followed the plane to it’s landing spot in the tree. There, the plane ripped itself in two, the open hulk allowed for the Spinosaurus to fit it’s thin snout into the plane and grab Nash. 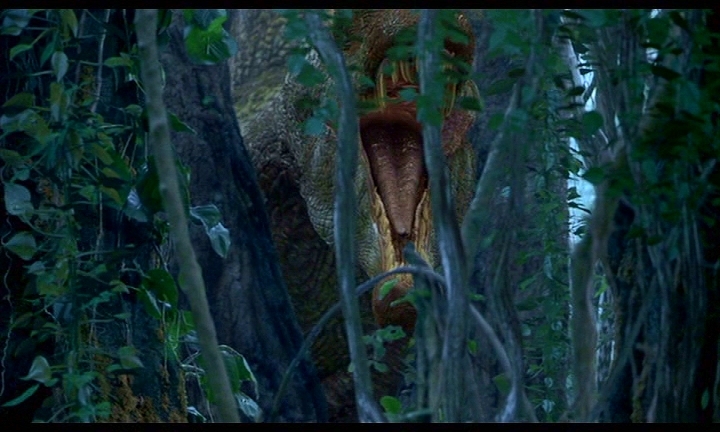 Nash was then dropped to the ground, where he tried to scramble away before the Spinosaurus pinned and devoured him. The plant then fell out of the tree with the occupants still inside. 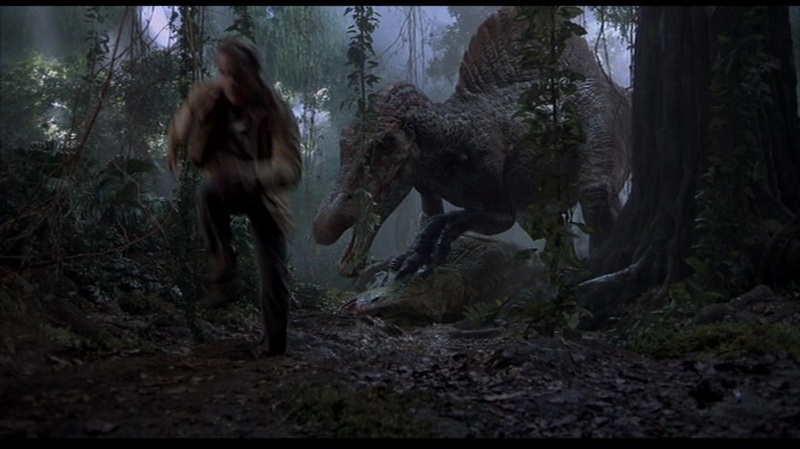 As the Spinosaurus ripped apart the fuselage, the Kirbies, Udesky, Dr. Alan Grant, and Dr. Grant’s field assistant, Billy Brennan, scrambled out of the wreckage and began to flee, to which the Spinosaurus took notice and gave chase. Pursuing the humans through the jungle and across a field, the Spinosaurus was held up when the thick foliage prevented it from proceeding. 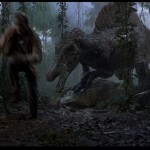 The group, believing they were safe, headed a little further, but encountered a male Tyrannosaurus rex, which chased them back to a forest clearing. There, the Spinosaurus had found a way around the blockage of trees and had continued chase, only to find the Tyrannosaurus in it’s territory and the two began to prepare for a fight. After a series of roars and circling to size each other up, a slap across the face to the Tyrannosaurus from the Spinosaurus sparked the battle. 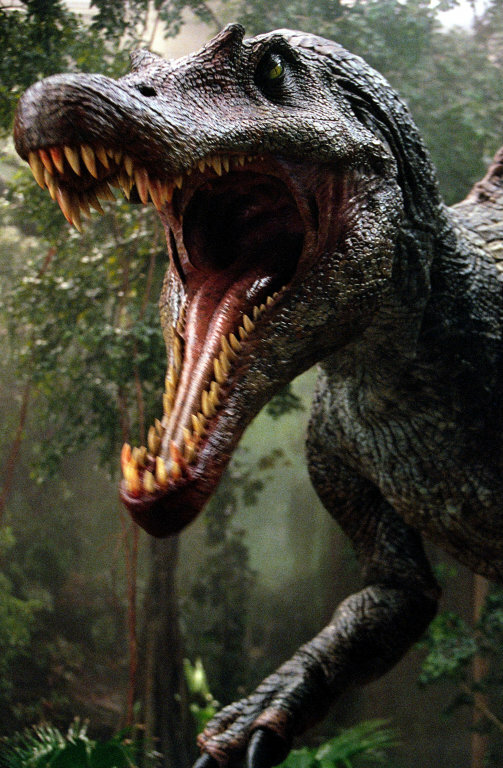 The T. rex charged and bit the Spinosaurus‘ neck, slamming it to the ground, only for the Spinosaurus to twist itself out of the smaller theropod’s grip and retaliate. Beating back the male T. rex, the Spinosaurus bit down onto the sub-adult’s neck and twisted it, snapping the neck and killing the Tyrannosaurus. The Spinosaurus than stood over the Tyrannosaurus‘ body, and gave out a victorious bellow. 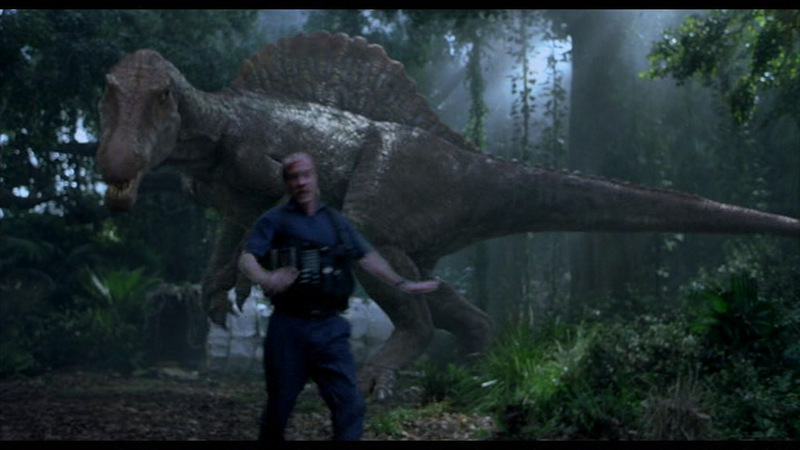 The Spinosaurus was not encountered again until after Dr. Grant had finally found Eric Kirby. 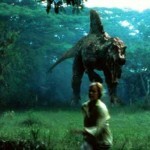 The two had been lured to the site of a gigantic fence near the Isla Sorna Aviary observatory. 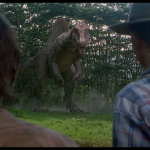 There, Dr. Grant and Eric met with Billy and Mr. and Mrs. Kirby on the other side of the fence, sans Udesky who had been killed by Velociraptors. What had lured Eric and Dr. Grant to the site was the sound of the ringtone on Paul Kirby’s satellite phone, which mirrored the jingle from Paul Kirby’s hardware store: Kirby Paint and Tile Plus. However, the ringing was actually coming from the gullet of the Spinosaurus, who had swallowed the phone when it ate Nash. Dr. Grant and Eric, noticing the Spinosaurus standing menacingly at the edge of the jungle, ran, only for the Spinosaurus to give chase. 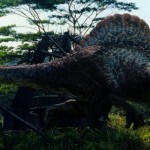 The two humans were capable of narrowly escaping through a hole in the bottom of the fencing, and the Spinosaurus appeared to give up, only to turn back and bust through the fence and continue to chase the group all the way to the aviary observatory, where the group locked it out. The Spinosaurus was not encountered again until later that night at a riverside InGen construction area, when it ambushed the group on a barge that had been accessed after the group took a trip through the aviary, during which Billy Brennan was apparently lost to the mutated Pteranodons that were being kept inside. 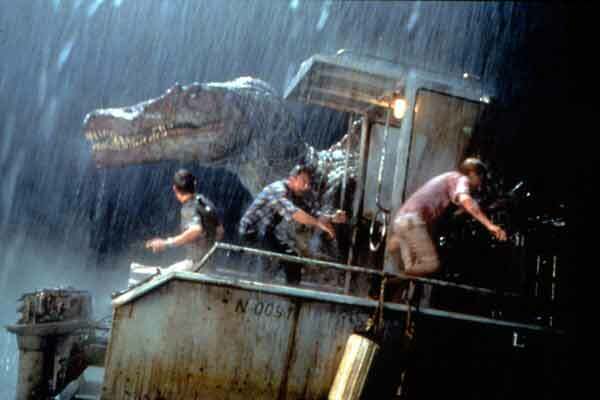 The Spinosaurus, leaping from the water, attacked the barge, smashing the bridge house and puncturing the gas tank. It then overturned the barge, which sank the cage that the barge was transporting, with Eric and Amanda Kirby inside. Paul Kirby, who saw the animal attacking his family, climbed a partially submerged crane and diverted the beasts’ attention. 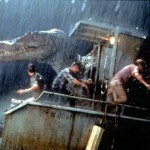 The Spinosaurus, now attacking the crane instead of the cage, did not notice it was standing in the pool of gasoline that had leaked from the boat and while knocking the crane with it’s snout in an attempt to get at Paul, Dr. Grant shot it with a flare gun, inadvertently igniting the gasoline as well. 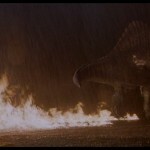 The Spinosaurus, stunned, fled the scene in panic and was not seen from again. 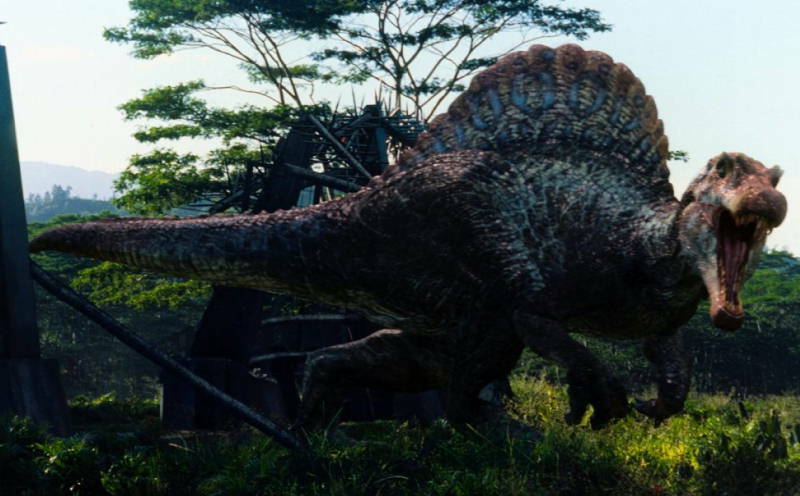 It was later revealed, via the Dinosaur Protection Group, that this Spinosaurus was later moved to Isla Nublar to be used in an unknown upcoming attraction in the Masrani-led Jurassic World theme park. However, the animal died in captivity before it could become an attraction. The animal’s remains were later mounted and displayed on the Jurassic World Main Street.